Today's job market is tough; it's dog-eat-dog, ruthless and competitive. Preparation is essential if you want to get the edge. As psychometric testing becomes standard for blue-chip companies to one-man bands this For Dummies guide could mean the difference between success and failure. As the world of HR embraces psychometric testing, more and more people are faced with the daunting prospect of having to sit these mysterious exams. The tests have become the standard way in which employers judge abilities - your capacity to work with numbers, words and diagrams; your attainment - what you actually know; and your personality - how you're likely to act. 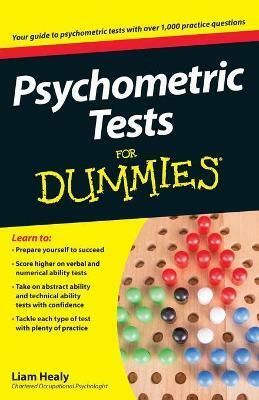 Psychometric Testing For Dummies is the essential tool for being prepared and calm. The book takes readers step-by-step through each type of test, what to expect and how to prepare for them. It also offers over 850 sample questions to practice on. Psychometric Testing For Dummies makes these notoriously difficult and confusing tests easy. Introduction. Part I: Testing Basics. Chapter 1: Understanding Psychometric Tests.9 Chapter 2: Setting Your Mind at Rest About Psychometric Tests. Chapter 3: Preparing For a Psychometric Test. Chapter 4: Dealing with Feedback. Part II: Finding Out About Different Types of Tests. Chapter 5: Finding the Right Words: Verbal Ability Tests. Chapter 6: Doing Your Sums: Numerical Ability Tests. Chapter 7: Getting all Creative: Abstract Ability Tests. Chapter 8: Saying It Without Words: Technical Ability Tests. Chapter 9: Seeing the Real You: Personality Tests. Part III: Getting Some Practise In: Sample Tests. Chapter 10: Verbal Ability Sample Tests. Chapter 11: Numerical Ability Sample Tests. Chapter 12: Abstract Ability Sample Tests. Chapter 13: Technical Ability Sample Tests. Chapter 14: Personality Assessment Sample Tests. Part IV: The Part of Tens. Chapter 15: Ten Things to Remember for the Test Session. Chapter 16: Ten Calming Thoughts to Keep in Mind. Index. Liam Healy is a British Psychological Society registered Chartered Occupational Psychologist. He is the Managing Director of CareerPsychologyCentre.com, a successful career guidance web site, and is a senior consultant with Liam Healy & Associates. He has written numerous books and articles on the subject of psychometric testing. He develops and publishes psychometric tests for corporate clients globally, and helped to pioneer the use of the Internet in psychometric testing in the UK.